Recently I hosted a brunch gathering with my old high school friends, their kids, and hubbies. We don’t get together very often as we’re all busy with our own families, work, and life in general but I love when we’re all able to pile into someone’s home – because let’s be honest, with kids it’s usually easier to entertain at home. Hosting a brunch is one of my favorite ways to entertain. I love brunch. I love everything about brunch. The food. The mimosas. The conversation. But especially the friends. Today I’m sharing all the details to throw a brunch party with your friends. Now I don’t always decorate to this extent, but sometimes it’s fun to throw together something beautiful to enjoy. 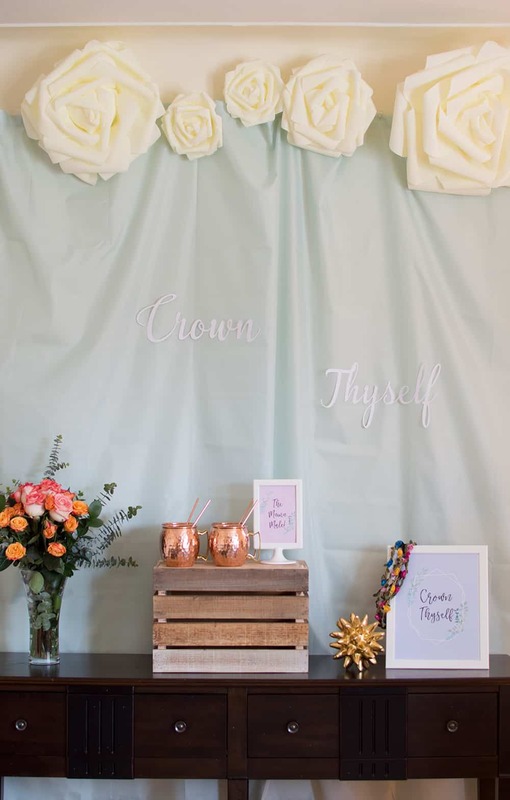 Parties are my love language and my creative outlet, so when I get the chance to decorate and see the delight in the faces of people I love, I jump at the chance. I decided we should Crown Thyself in motherhood, friendship, and frankly, just because. As always, my console table in my living room is one of my favorite spots to decorate. 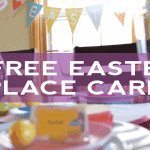 Being close to the front door, it’s a great place to welcome guests, display desserts, party bites, and fun drinks. I’ve decorated it for my youngest’s lumberjack birthday and puppy party, and for holidays such as Galentine’s Day, St. Patrick’s Day, and Christmas. It’s a great spot, with a wall just waiting to be decorated. I love this wall, but sometimes it needs a little dressing up. It’s a light cream color, and while in person looks nice, it can look a little plain, especially in photographs. I opted to address this by hanging a sea foam shower curtain using 3M wall hanging strips. I love using temporary strips because they leave no damage to the wall. At the top, I hung these amazing foam flowers I bought from Oriental Trading. You will want to get a variety of sizes. Here I’ve used the Small, Medium, and Large. I recently used them again, and will be sharing that party setup in another post. The flowers added a great touch to the backdrop, while hiding the top of the shower curtain. I always like to add a little extra detail here, whenever possible, so it’s not just an abrupt end to it at the top of the wall. 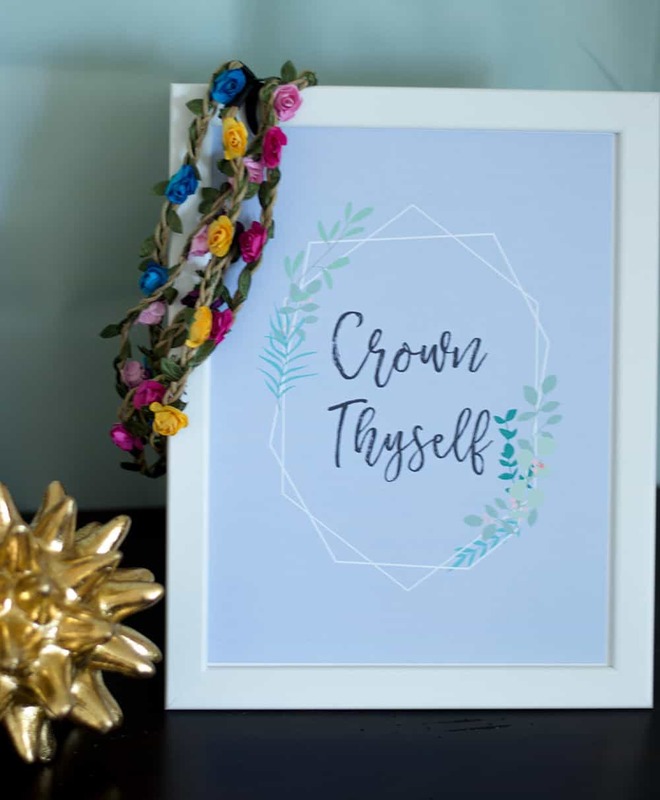 Using my Silhouette Cameo, I cut out “Crown Thyself” in a scripty font. I had run out of darker paper, unfortunately, and opted for white. It worked in person, but I wish it had a little more dimension for the photographs. It’s a good reminder to check supplies, especially before events. I’ve definitely had to Amazon Prime some printer ink the morning of a party. Please tell me I’m not the only one to do this! Add some pretty flowers to a vase. These are Trader Joe’s bouquets and are always a great price! I love how the roses in the bouquet tie into the flowers at the top, as well as the printables I created for this occasion! 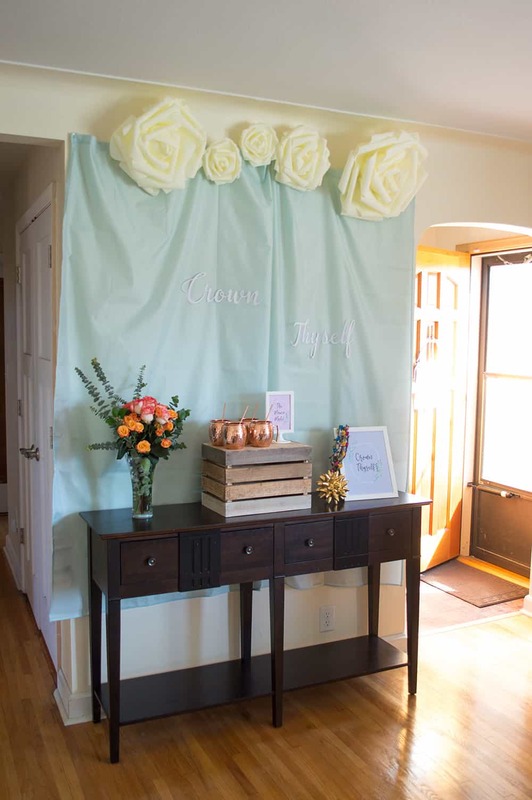 Now one of my favorite parts of this welcome table are the flower crowns, where each brunch guest (or at least the ladies) was given the chance to crown thyself. These flower crowns are so economical and would be very fun for a bridal shower or bachelorette party, especially if you don’t want to make your own. These flower crowns are a great buy and your lady friends will love the special gesture. But my other favorite aspect of this welcome table are the drinks. I’ve recently been getting into Moscow Mules at home. I occasionally order them at happy hour, but why not make them at home? 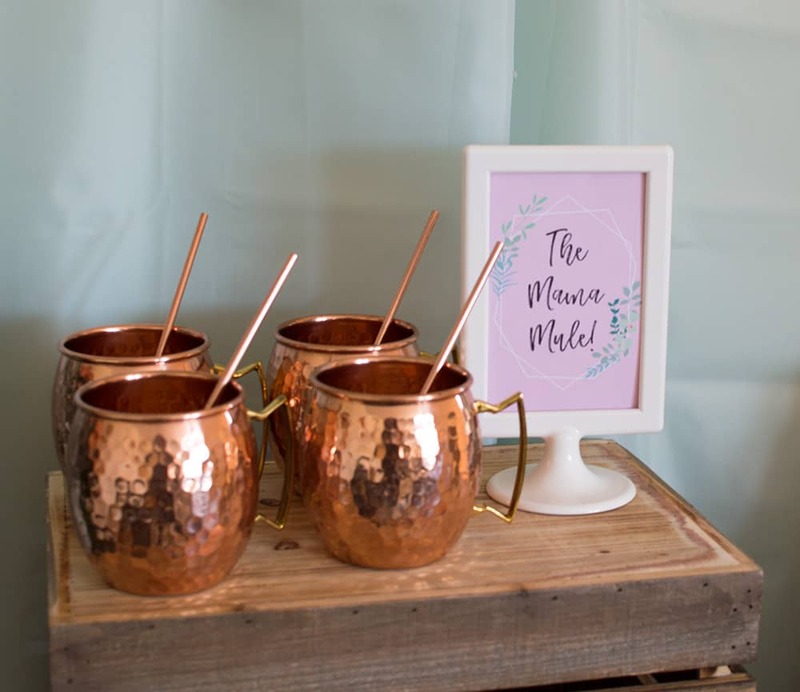 It’s not hard, you only need a few supplies, such as these Moscow Mule mugs, and a great drink recipe. But this isn’t your normal Moscow Mule, because who wants to drink a full on vodka drink at 11:00 am? Ok, ok, aside from a Bloody Mary. When I think of brunch I always think of mimosas, and yes, we had those too. More on that later. So I had the brilliant idea that there must be a Moscow Mule recipe that adds champagne. And lo and behold there was! I deemed it the Mama Mule and it didn’t disappoint. 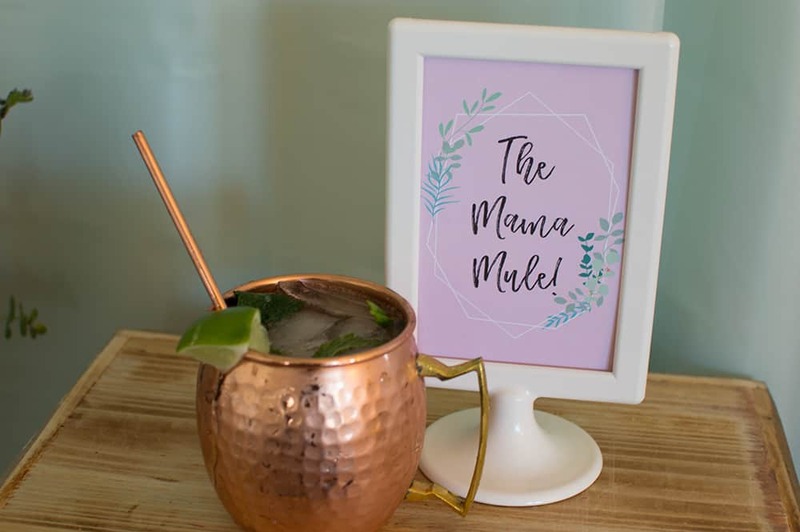 The Mama Mule is basically a Moscow Mule base but then pour in some champagne over the top and garnish. I found this recipe at Delish.com, if you want the step-by-step instructions. Cheers to a fun take on the Moscow Mule – with champagne! I love setting the table into a beautiful tablescape. It’s easy and makes the dining experience so lovely when there are pretty centerpieces, nice napkins, and matching plates. 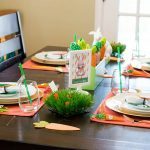 Some of my favorite tablescapes include this Kentucky Derby collaboration, my festive Fall tablescape, and this Carrot Patch Easter table. Pretty tables are a chance to gather with your friends and family over good food… and hopefully some wine! 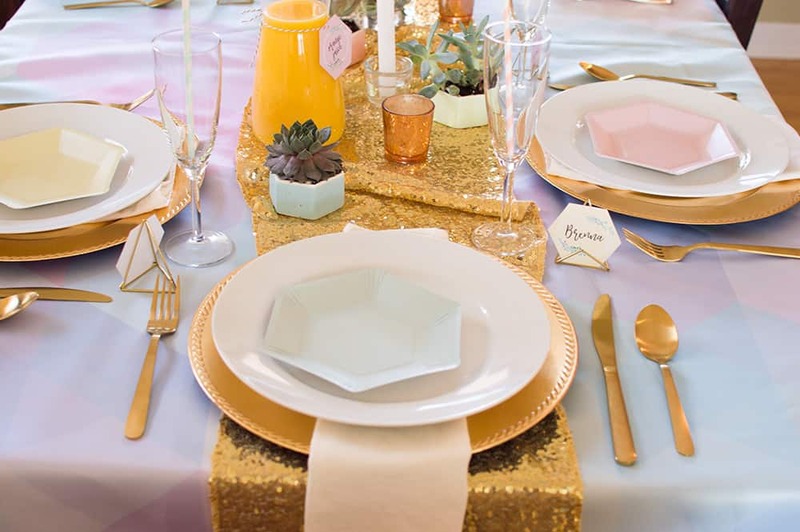 Put aside the white and start with a fun hexagon table cloth in pastel colors and then add in a sparkly gold table runner. 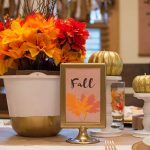 Layering is an easy way to bring together a unique look to your tablescape. For the centerpiece I kept it simple by adding in more flowers, but then I added in some cute succulents in these tiny little pastel pots, mercury glass gold candles, and some white tapered candles. 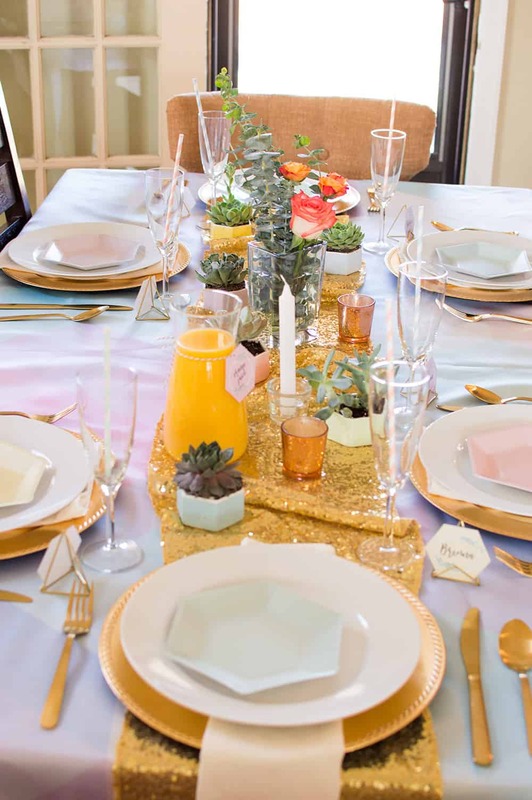 The greenery against the gold, the sweet pastels, and the pop of gold create a beautiful landscape for our dining adventure. 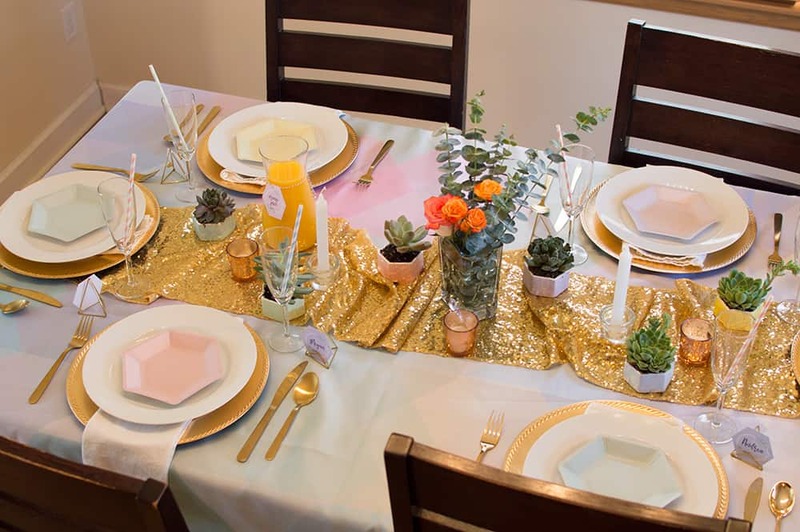 Pretty flowers, succulents, and candles make a lovely centerpiece atop a sparkly gold runner. Invest in some gold chargers, but without breaking the bank. Seriously you can get these at the Dollar Store, Hobby Lobby, or if you really want to splurge, these are gorgeous metal ones. I’ve then placed a white napkin, as I was trying to use what I had on hand, but I love these World Market cloth napkins. They come in an array of pretty colors for a great price. My white Crate and Barrel plates topped with a hexagon paper plate in the same pastel color palette work great together. Now add in some pretty gold cutlery. A place setting is not complete without a sweet touch. 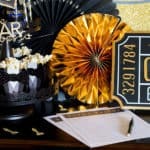 I love adding place cards to tables for an inviting detail. 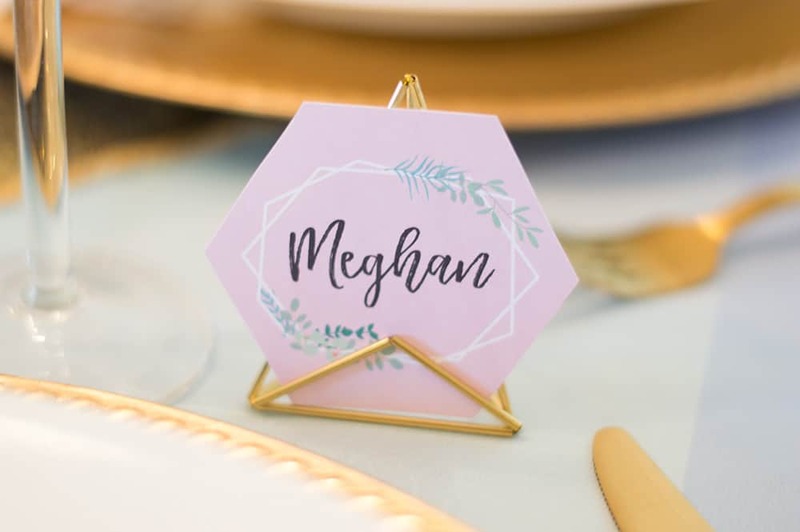 These uniquely-shaped place cards continue with the hexagon theme and these brass geometric place card holders will add a little wow-factor to your table. It’s all in the tiniest details! As I mentioned before, I love brunch food. I have my go-to favorite quiches, which never disappoint and I’ve often been asked to share the recipe with friends. This crustless veggie quiche is a fave, if you’re curious. However, for this celebration it had already been a busy week and I decided to focus my energy on the decorations instead of the food. So off I went to Trader Joe’s and picked up a few of their frozen quiches. The friends brought pastries, fruit and cheesy potatoes and brunch was complete, easy, and yummy. In the end, the best part of the day was snuggling babies, catching up, and enjoying each other’s company. This is such a pretty brunch!! I love the tablescape! Thanks, Holly! 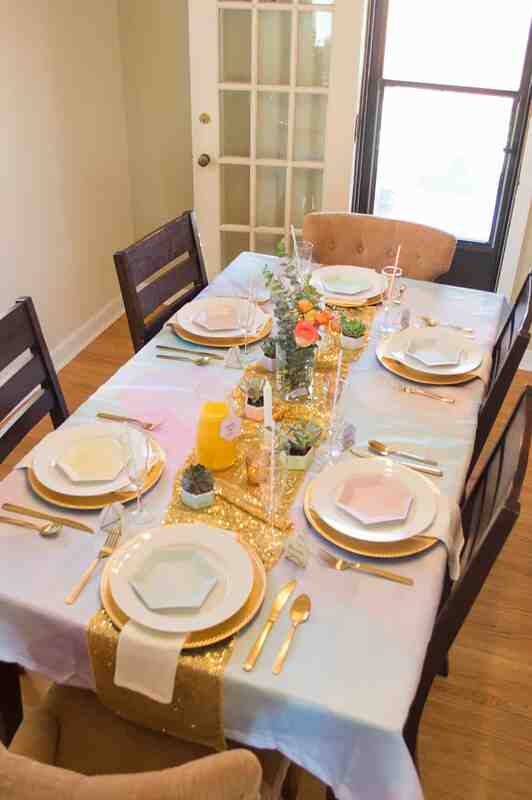 Brunch with friends is the best and why not make it pretty? I had so much fun setting this table.